Connexions, an information clearinghouse founded to promote justice, democracy, and social and environmental alternatives, has compiled this Web gateway to selected resources on Israel/Palestine. These resources were selected to help those who believe that a solution to the conflict is possible only on the basis of justice, equality, mutual recognition and an end to Israels occupation of the Palestinian territories. A more extensive selection of books, documentaries, videos, documents and articles is on the Connexions Library under subject headings such as Israel, Palestine, Apartheid, Arab-Israeli Issues, Discrimination, Ethnic Nationalism, Gaza Strip, Human Rights Abuses, International Law, Israeli Apartheid (Hafrada), Israeli Settlements, Media Coverage/Middle East, Occupied Territories, Palestinian Refugees, Refugees, Refugees/Right of Return, War Crimes, Zionism. Other organizations may be found in the Connexions Directory, especially under Israel and Palestine in the Subject Index. The Connexions Web site  www.connexions.org  also features a library of articles and links concerned with alternatives and social justice issues generally. A printable PDF of the organizations, Web sites, and news sources featured on this page is available here. See below for more articles. Ali Abunimah. If there was ever a moment when the peoples of the region would accept Israel as a Zionist state in their midst, that has passed forever. Israel’s “military deterrent” has now been repeatedly discredited as a means to force Palestinians and other Arabs to accept Zionist supremacy as inevitable and permanent. Now, the other pillar of Israeli power – Western support and complicity – is starting to crack. We must do all we can to push it over. Israel in Gaza: A Critical Reframing. Jeff Halper. The critical reframing we offer, that of Israelis committed to human rights, international law and a just peace as the only way out of this interminable and bloody conflict, argues that security cannot be achieved unilaterally while one side oppresses the other. Justin Podur. If you want to have the first idea about what is happening in Israel/Palestine (or most of the rest of the world), the best thing to do is to turn them off the mainstream Canadian media. Naomi Klein. January 7, 2009. The best strategy to end the increasingly bloody occupation is for Israel to become the target of the kind of global movement that put an end to apartheid in South Africa. Advocates for a just foreign policy regarding Middle-East issues; demands that the Canadian government uphold and enforce all UN resolutions and instruments of international law, both in word and in deed; challenges the media to present balanced and objective coverage of the Israeli-Palestinian conflict. 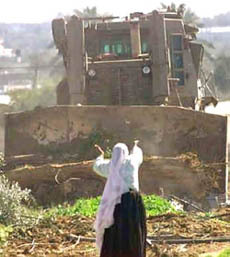 A non-violent, direct-action group originally established to oppose and resist Israeli demolition of Palestinian houses in the Occupied Territories, now also engaged in resistance activities in other areas - land expropriation, settlement expansion, by-pass road construction, policies of closure and separation, the wholesale uprooting of fruit and olive trees and more. Gush Shalom (the name means Peace Bloc in Hebrew) is an extra-parliamentary organization, independent of any party or other political grouping, which has played an important role in setting the moral and political agenda of the peace forces in Israel, as well as in breaking the so-called national consensus based on misinformation. The primary aim of Gush Shalom is to influence Israeli public opinion and lead it towards peace and conciliation with the Palestinian people. A national human rights organization whose mandate is to promote a just resolution to the dispute in Israel and Palestine through the application of international law and respect for the human rights of all parties. The Israeli Information Center for Human Rights in the Occupied Territories. Campaigning to transform the Israeli apartheid system into a secular democracy, where Israelis and Palestinians will live as equal citizens. A predominantly Jewish organization deeply committed to a peaceful and just resolution of the Israeli/Palestinian conflict, a resolution that will provide safety, security and freedom for Jews, Palestinians, and all others living in this region. We believe that such a peace can only be achieved when Israel withdraws from its settlements in the Palestinian territories and addresses the legitimate national and human rights of the Palestinian people. Palestinian-led movement committed to resisting the Israeli occupation of Palestinian land using nonviolent, direct-action methods and principles. Believes that Israel is an apartheid state that resembles South African Apartheid and that justice will not be achieved without equal rights for everyone in the region, regardless of religion, ethnicity or nationality. Maps showing the extent of Israels land seizures. 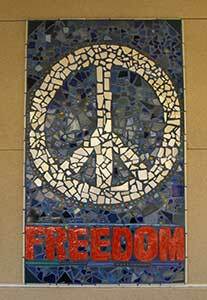 From the Interfaith Peace Initiative. Makes the case for action against companies that profit from the Israeli occupation. Partnership of Jewish and Arab eco-builders, architects, academics, and farmers promoting social and environmental justice in Israel/Palestine. Cultivates sustainable models to effect change by combining advocacy and in-depth political analysis with strategic action and utilizes principles of permaculture and non-violent direct action across ethnic divides. Zatoun (the Arabic word for olive) is a non-profit organization which sells Palestinian olive oil to benefit Palestinian farmers and their children living in occupied Palestine, and which works to create awareness for peace in Palestine. Excellent French newspaper with in-depth analytical articles. Also in English, German, and other languages. An American newsletter featuring numerous articles about the Middle East. Independent online newspaper providing daily news, commentary, features and book reviews on a variety of subjects, largely focused on Palestine, the Arab-Israeli conflict and the Middle East as a whole. UK-based Web site aspires to redress the balance of world news and information by being a voice for the voiceless, by focusing on injustice and by providing an alternative interpretation of international and domestic issues. News, summaries, and commentary by people opposing Israels occupation of the Palestinian territories. In Hebrew, English and Russian. Web site featuring articles by Robert Fisk, Middle East correspondent for the Independent newspaper. Web site featuring articles of Jonathan Cook, a British journalist based in Nazareth. Presents Israeli and Palestinian viewpoints on prominent issues of concern, focusing on the Palestinian-Israeli conflict and peace process. Produced, edited and partially written by Ghassan Khatib, a Palestinian, and Yossi Alpher, an Israeli. Its goal is to contribute to mutual understanding through the open exchange of ideas. A more extensive list of articles, books, and other resources is available in the Connexions Library under subject headings such as Israel, Palestine, Apartheid, Arab-Israeli Issues, Discrimination, Ethnic Nationalism, Gaza Strip, Human Rights Abuses, International Law, Israeli Apartheid (Hafrada), Israeli Settlements, Media Coverage/Middle East, Occupied Territories, Palestinian Refugees, Refugees, Refugees/Right of Return, War Crimes, Zionism. Jewish Israelis celebrate, and governments around the world stand by passively, as Israel massacres Palestinians in Gaza. Inaction by Western governments ensures that Israel will feel embolded to commit further massacres in the future. The pro-Palestine solidarity movement could enlarge its following, convince more influential supporters, and get past trivial, harmful and sectarian disputes -- if it wants to. A boycott must be humanist, as is the cause of supporting Palestinian self-determination. Boycotting humanism allows the cynical internal corrosion of any political movement of the left. According to the Israeli Committee against House Demolitions, an Israeli NGO, the Israeli government has demolished 28,000 Palestinian structures since the Occupation of the West Bank and Gaza began in 1967, resulting in the homelessness and suffering of untold numbers of people. There is little ambiguity about the morality of this form of ethnic cleansing, and even most Israeli legal scholars agree that it is in contravention of international law. Al Jazeera spoke with 11 villagers on the anniversary of Bilin's weekly protests against Israel's separation wall. How come all those Palestinians  all 1.5 million  are crammed into Gaza in the first place? Well, their families once lived, didnt they, in what is now called Israel? And got chucked out  or fled for their lives  when the Israeli state was created. Ayman Rabi on the 2.1 million Palestinians who suffer an artificial water scarcity deliberately created and sustained by Israels military occupation and the private Israeli water company Mekorot. "What Comes Next? : A forum on the end of the two-state paradigm" was initiated by Jewish Voice for Peace as an investigation into the current state of thinking about one state and two state solutions, and the collection has been further expanded by Mondoweiss to mark 20 years since the beginning of the Oslo peace process. Once we connect the dots it is not hard to see that the occupation of the West Bank and Gaza is only a small part of the Israeli Palestinian issue. The greater issue is the ongoing ethnic cleansing of Palestine by the Zionist state. The way forward for Israelis and Palestinians alike is to oppose the ethnic cleansing by opposing all its manifestations. Eventually a state that represents all its inhabitants on the basis of equality and genuine respect and dignity for all its citizens is one that the world will some day celebrate, not a phony declaration that legitimizes the oppressive nature of one and confers false hope on the other. We, workers from all sectors, Arabs and Jews, marched to the square on Saturday with a clear message: Bibi, your time is up, go home! We marched with a socialist worldview, according to which the economy should exist to serve society, not capital. Those who truly struggle for social justice must seek universal justice. There will be no true welfare state until the occupation is ended! In the past 10 years Israeli forces have killed at least 255 Palestinian minors by fire to the head, and the number may actually be greater, since in many instances the specific bodily location of the lethal trauma is unlisted. In addition, this statistic does not include the many more Palestinian youngsters shot in the head by Israeli soldiers who survived, in one form or another. Some 20 political parties and social movements from both sides of the Green Line issued an historic declaration in support of the social protests currently rocking Israel and their necessary linkage to the struggle against Israels occupation and colonial policies. It is important that we preserve the distinction between the Palestinian Authority and Palestinian people, who have held on to their rights for so many years, and unleashed two of the greatest expressions of people's power and resolve: the First Uprising of 1987 and al-Aqsa Intifada of 2000. A whole population taking on the self-celebrated "greatest army in the Middle East" is hardly "powerless". The Palestinian people have printed themselves on the practical discourse of this conflict, and they have proved themselves to be powerful players in determining their own fate. The Electronic Intifada, the online publication about Palestine, finds itself at the centre of a storm as a pro-Israel group applies pressure to have a grant from a Dutch foundation withdrawn. This assault is part of a well-coordinated, escalating Israeli government-endorsed effort to vilify individuals and cripple organisations that criticise Israel's human rights record and call for it to respect Palestinian rights and international law. How should decent people respond to the Middle-East conflict? We should support equality, not Zionist ethnic cleansing. Equality is the way to make a better world for ordinary people from Watertown to Ramallah to Tel Aviv, and it is the only way to end racist ideologies such as anti-Semitism and Zionism. In the summer of 1947 a steamer named the Exodus set out from France to run the British blockade of Palestine. The British authorities boarded and seized the ship, and killed three passengers who tried to fight the British attackers. The British succeeded in preventing the ship from landing, but the event helped to turn world public opinion against the British. Israel's attack on the Gaza aid convoy may prove to have the same result. Israel's leadership is committed to "a dynamic state bent upon expansion". The greatest threat to continued expansion is the threat of peace. Whenever Israel's leadership is faced with the threat of peace, it initiates violence designed to stop it. Israel is feeling cornered on every front it considers important; and like Dayan's 'mad dog,' it is likely to strike out in unpredictable ways. These trends are likely only to deepen in the coming months and years. The mad dog is baring his teeth, and it is high time the international community decided how to deal with him. Without much stronger international pressure than the international community has applied to date, there is every reason to expect Israeli massacres to steadily become more severe, their PR rationales more outlandish. Mild diplomatic rebukes will not sway them. Unless serious costs are imposed for such crimes, much worse is yet to come. Once again the US government has permitted the Israeli state to murder good people known for their moral conscience. The Israeli state has declared that anyone with a moral conscience is an enemy of Israel. What happened with the Gaza flotilla was not an accident. You have to remember that the Israeli cabinet met for a full a week. All the cabinet ministers discussed and deliberated how they would handle the flotilla. At the end of the day, they decided on a nighttime armed commando raid on a humanitarian convoy. Israel is now a lunatic state. It's a lunatic state with between two and three hundred nuclear devices. It is threatening war daily against Iran and against Hezbollah in Lebanon. We have to ask ourselves a simple, basic, fundamental question: can a lunatic state like Israel be trusted with two to three hundred nuclear devices when it is now threatening its neighbours Iran and Lebanon with an attack? The Israeli government and its right-wing supporters have been waging a 'McCarthyite' campaign against human-rights groups by blaming them for the barrage of international criticism that has followed Israel's attack on Gaza a year ago, critics say. It is imperative that the international community view the Israeli response to the Goldstone report as a blatant attempt to whitewash its crimes in Gaza, and refer the matter to the ICC without further delay. To do otherwise will only continue to encourage Israeli intransigence. Reut's analysis vindicates the effectiveness of the Boycot Divestment Sanctions strategy. As Israeli elites increasingly fear for the long-term prospects of the Zionist project they are likely to be more ruthless, unscrupulous and desperate than ever. In a climate in which the call for a consumer boycott of Israeli goods is finally gaining strength, one area of Israel's economy is, as yet, surprisingly under-researched. Most of Israel's industrial zones in the West Bank are connected to illegal residential settlements and provide an indispensable economic backbone to the local settler economy. Business areas like the industrial zones are at the forefront of Israel's brutal occupation of Palestine, facilitating ethnic cleansing and acting hand-in-hand with the Israeli state in their quest for territorial dominance. It may yet be the case that, as in the anti-apartheid struggle, the shift in the relation of forces in the Palestinians' favour will occur not through diplomacy or as a result of armed resistance, but on the symbolic battlefield of legitimacy that has become global in scope. The brave people who took to the streets to demand boycott, divestment and sanctions against Israel and Israeli companies have received a clear message that their efforts are not in vain. Private companies that seek to make easy profits in Palestine while ignoring the injustices and illegality of Israel's crimes there, will have to think twice about their investments. They may be required to pay a price in actual money for the moral deficit in their accounts. In a bid to staunch the flow of damaging evidence of war crimes committed during Israel's winter assault on Gaza, the Israeli government has launched a campaign to clamp down on human rights groups, both in Israel and abroad. Oxfam International presents testimonies of Palestinian men and women who recount their daily problems, arising from the construction of Israel's illegal Wall and its associated regime of land confiscation and permits, and settlement construction. Legally and morally, an aggressor cannot rely upon self-defence to justify violence against resistance to its own aggression. The most plausible reason Israel is fighting Hamas (and the PLO before it) is 'self-defence', not against rockets and mortars, but against having to make peace with the Palestinians on the basis of the pre-1967 borders as required by international law. As the Israelis try to justify the massive loss of civilian life in Gaza, their arguments and counter-charges continue to be shot down either by the United Nations or by international human rights organizations. The record shows that Hamas wanted to continue the ceasefire, but only on condition that Israel eases the blockade. Long before Hamas began the retaliatory rocket attacks on Israel, Palestinians were facing a humanitarian crisis in Gaza because of the blockade. The critical reframing we offer, that of Israelis committed to human rights, international law and a just peace as the only way out of this interminable and bloody conflict, argues that security cannot be achieved unilaterally while one side oppresses the other and that Israel's attack on Gaza is merely another attempt to render its Occupation permanent by destroying any source of effective resistance. As the conflict between Israel and the Palestinians has once again flared up following Israel's ongoing air and ground assault on the Gaza Strip, the IMEU presents a comparison of Israeli and Palestinian military capabilities. (Jaunary 2009). In the past the world knew how to fight criminal policies. The boycott on South Africa was effective, but Israel is handled with kid gloves: its trade relations are flourishing, academic and cultural cooperation continue and intensify with diplomatic support. This international backing must stop. That is the only way to stop the insatiable Israeli violence. Demonstrates with cold precision how the consistent denial of truth about the Palestinians by governments and the media in the West has led to the current impasse in Middle East politics. Controversial, forceful, and 'above all' honest, it attempts to redress a sustained crime against historical truth in order to make a more rational political future in Palestine possible. Searing essays from Noam Chomsky, Norman Finkelstein, Peretz Kidron, G. W. Bowerstock, Ibrahim and Janet L. Abu-Lughod, Mumammad Hallaj, Elia Zureik, and Rashid Khalidi. Groundbreaking exposé of Israel's terrifying reconceptualization of geopolitics in the Occupied Territories and beyond. Challenges generally accepted truths of the Israel-Palestine conflict as well as much of the revisionist literature. This new and enlarged edition critically re-examines dominant popular and scholarly images in the light of the current debacle of a "peace" process. Author: Mearsheimer, John J., Walt, Stephen M.
Mearsheimer and Walt describe the remarkable level of material and diplomatic support that the United States provides to Israel and argue that this support cannot be fully explained in either strategic or moral grounds. This exceptional relationship is due largely to the political influence of a loose coalition of individuals and organizations that actively work to shape U.S. foreign policy in a pro-Israel direction. Mearsheimer and Walt contend that the lobby has a far-reaching impact on America's posture throughout the Middle East and the policies it has encouraged are in neither America's national interest nor Israel's long-term interest. +972 is a blog-based web magazine jointly owned by a group of Israeli journalists and bloggers whose goal is to provide fresh, original, on-the-ground analysis and reporting of events in Israel and the Palestinian territories. More than an ordinary tourist guidebook, this book provides an in-depth discovery of the entire range of Palestinian culture: historical, archaelogical, religious, and architectural, as well as the daily realities of the Israeli occupation. This is a collection of interviews, edited, introduced, and annotated by Farber, a member of Jews Against The Occupation. The contributors are among the leading American Jewish critics of Zionism and of Israel's policies towards the Palestinians. The book articualtes the reason behind the dissent and a vocbulary and framework to express it. Leading Israeli scholar with a major re-evaluation of Zionist ideology and literature. A selection of quotes about Palestine and Israel.